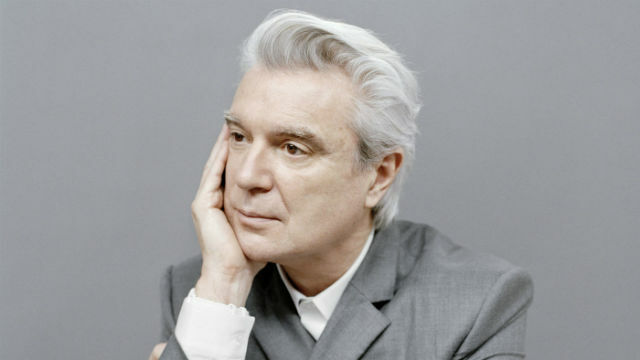 Former Talking Heads frontman and revered solo artist David Byrne is nothing if not a master of nuance of subtlety. And he proved this when playing two separate shows (on each side of his Coachella stop) at the San Diego Civic Theatre. But the singer wasn’t alone for long — by the end of his opener and throughout the 140-minute performance, he was accompanied by an 11-member band that was constantly in choreographed motion. With no equipment anchored to the floor, the musicians glided in and out of sight via chain-link curtains surrounding the three sides of the stage. Utilizing harnesses for the larger instruments, the unencumbered band was free to move about, dance as they played and even fall into formation, as if a marching band. “The human beings become the set,” Byrne said, describing the stage design. The Rock & Roll Hall of Famer is touring in support of American Utopia, his first new release in 14 years. Steeped in Afro-Cuban rhythms, the songs he played from the album meshed perfectly with percussive Heads classics. The set list was a pretty even mix of familiar hits, like “This Must Be the Place (Naive Melody)” and “Burning Down the House,” new songs most had yet to hear for the first time (to Byrne’s credit, everyone who bought a ticket to the show received a free CD), and interesting one-offs, such as his collaborations with St. Vincent and Fatboy Slim. Barefoot and dressed in a slate gray suit (as was every band member), Byrne shimmied and swayed to each song, igniting the crowd with his awkward yet irresistible dance moves. Despite all the upbeat energy on stage, many of the songs tackled heady subjects — from unwelcome refugees (“Gasoline and Dirty Sheets”) to a Martian’s perspective on humanity (“Like Humans Do”). In fact, the band even closed the night on a somber tone, covering Janelle Monae’s “Hell You Talmbout,” a protest song about African-Americans killed due to racial violence. While the night’s performance wasn’t flawless — Byrne chose to restart a song that kicked off poorly and at one point he appeared confused by some missing band members — these are nitpickings in an otherwise top-notch show. At 65, Byrne’s vocals were remarkably strong and vibrant, ably hitting the high notes on “Bullet,” an American Utopia standout, and sounding no different than he did in 1980 as he sang the “same as it ever was” refrain from “Once in a Lifetime.” In the theatrical setting of the Civic Theatre, moments like these made one feel witness to something truly special. Byrne’s innovative “American Utopia” tour concludes in mid-September with two shows in the New York area. For the past 30 years, Donovan Roche has covered the world of music – from the release of Nirvana’s “Nevermind” to Prince’s unpronounceable name change to the return of Byrne.